Beautifully Formed in Polished Stainless Steel! Our Ford Transit Custom OEM Quality SPORT Side Bars ( SPORTLINE ) SWB are the latest addition to our extensive Custom Side Bars range. The quality is simply superb making these the best Transit Custom, Style upgrade product on the market! Our sportline side bars have been designed to add a simple but affective way to upgrade the look of your Transit Custom. The Tucked in Ends of the bars and a close to the body fittment adds an Aerodynamic look! Your Custom will have a "Lowered" look to it, Due to the Sportline position. 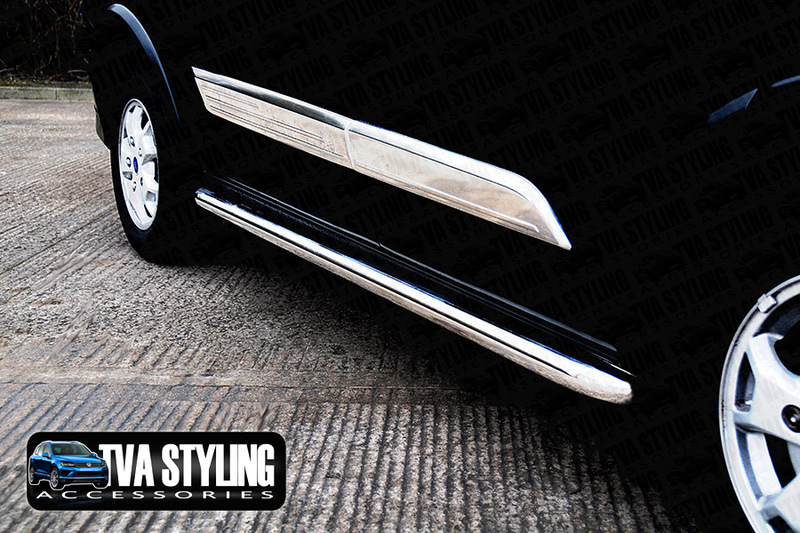 These SS001 Ford Transit Custom Sportline style chrome look sidebars fit all Short Wheel Base models! This product is totally NON DRILL and is supplied with all the fixing materials needed to fit the Ford Side Styling accessory to the vehicle. Excellent Quality Hand Polished Stainless Steel, Precision engineering, Ready to Fix! We use only the Best European Quality Chunky 60mm Stainless Steel Tube from Italian Steel Mills. Our Side Protection Tubes have a massive 1.5mm wall thickness for great OEM quality Side Bars. The price includes a pair of Sportline Side Bars for SHORT WHEEL BASE Ford Custom Van that fix to chassis frame mounting points. Fits Ford Transit Custom 2012> till current model. Excellent value for your Ford Transit Custom VAN giving an excellent finishing touch. Nice finish, makes van look lower, sportier. Fairly straight forward to fit although with a bit of fiddling and a couple of longer bolts a better finish can be achieved (personal taste). Great new bars, make the van look much lower than before, it had that jacked up look and now it appears to sit much lower. Had them fitted within an hour and great service too. Click the button below to add the Ford Transit Custom Side Bars OEM Sportline SWB 2012- to your wish list.